The couple say they found out in 2016, but some accusers believe they knew earlier. Gymnasts who were molested by doctor Larry Nassar are stepping up their attack on legendary Olympic coaches Martha and Bela Karolyi, with a call for Texas' top prosecutor to take action. The athletes' attorneys say the Karolyis may have violated child protection statutes by not alerting authorities to concerns about Nassar in the summer of 2015 — more than a year before he was publicly unmasked as a predator who penetrated young patients with ungloved hands under the guise of medical treatments. Gymnasts held a news conference outside AG Ken Paxton's office in Austin on Thursday to ask for an investigation. Paxton's office has said he will investigate if invited by the Texas Rangers or Walker County authorities, who already have a probe underway. The Walker County DA told NBC News he has not intention of asking Paxton for assistance. Jamie Dantzcher, a member of the 2000 Olympic team who says she was molested by Nassar during USA Gymnastics training camps at the Karolyis' Houston-area ranch, said the existing investigation isn't enough. "I don't understand why the Texas attorney general wouldn't do a thorough investigation," she told NBC News. "Is this not a serious issue?" In court papers filed last month, the Karolyis said that when USA Gymnastics informed them in 2015 that Nassar, who was USAG's team doctor, would not be returning to training camps at the ranch because of concern over his treatments, the sports federation didn't say he was suspected of sexual abuse. "The Karolyis first learned of the exact nature of Nassar's conduct leading to his dismissal — e.g. allegations of sexual misconduct — sometime after the 2016 Summer Olympics," they said in a lawsuit against USA Gymnastics and the U.S. Olympic Committee. That prompted John Manly -- who represents many of Nassar's accusers, including two who are suing the Karolyis -- to release a snippet of a videotaped lawsuit deposition of Martha Karolyi. "Were you ever advised by any USAG official in or around June of 2015 that they had received a complaint that Dr. Nassar had molested a national team gymnast at the ranch?" Manly asked during the May 2017 deposition. Karolyi's lawyer objected to the way the question was posed but allowed his client to answer. "Yes, I did," Karolyi said. Asked who told her, she said it was Steve Penny, who was the president of USA Gymnastics in 2015 but later stepped down under fire over his handling of the allegations against Nassar. An attorney for the Karolyis told NBC News that Martha misspoke. "Multiple objections were made to the question given its irrelevance to sexual assaults alleged to have occurred in prior years," the lawyer, Gary Jewell, said in a statement. "It is not uncommon in a deposition for a deponent to misunderstand a question or misspeak. Martha misunderstood the question and misspoke," Jewell wrote. "It was not realized until much later that she was not precise with her earlier testimony." The timing is important because after USA Gymnastics received the first complaint about Nassar, it hired an investigator and waited six weeks to alert the FBI — which took a year to meet with the gymnasts and never spoke to the Karolyis. During that year, Nassar continued to treat, and allegedly molest, patients at his Michigan State University practice, which has said it was not notified of the allegations or the investigation by USA Gymnastics or the FBI. In an exclusive interview with NBC News for a Dateline report that aired last month, Martha Karolyi detailed the phone call she said she got from Penny in late July 2015 and a subsequent conversation she said she had with Rhonda Faehn, who was USAG's vice president in charge of the women's program. "He [Penny] just told me over the phone that Larry Nassar will not be working anymore with the team. And I said, 'Why?' And he says, 'Well, you know, Marta, some girls have some concerns about his therapy methods, but we're investigating and taking care of things.' And that was my discussion with him," she said. She said he did not get into specifics about Nassar's methods and she did not understand there was an accusation of sexual abuse. Some days later, she spoke to Faehn at a competition, she said. "I ask, 'What is this about Larry Nassar? You know, what kind of methods?' 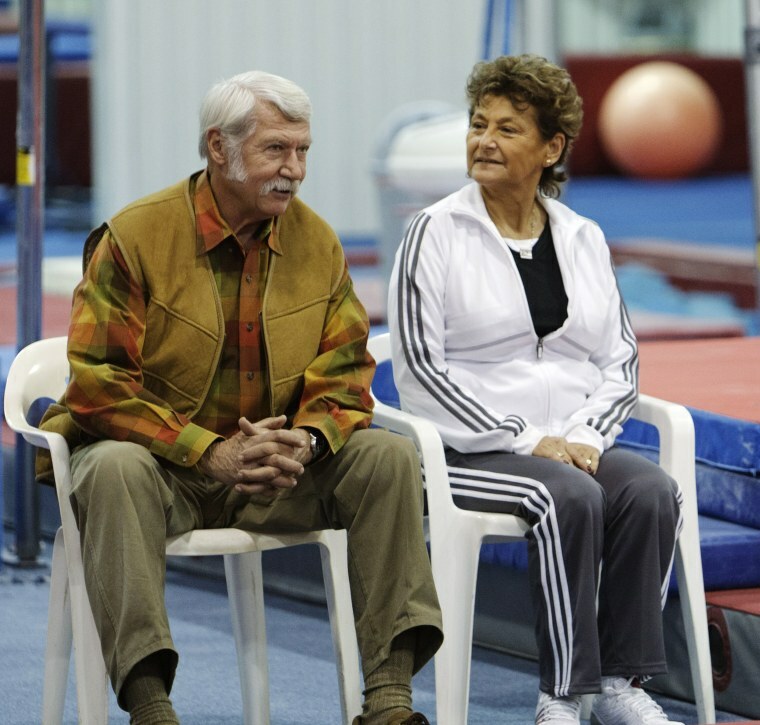 And then she [Faehn] told me that this is intervaginal treatments what he's using," Karolyi said in the interview. "I said, 'Oh, my God. I never heard about anything like that.' And I really didn't know a therapy method like this exists." Karolyi said she was shocked and pressed Faehn about it. "And she says, 'Well, you know, this is actually a recognized medical treatment.' I said, 'Whoa, really?'" Karolyi recalled. "Well, I believed her. She says, 'Oh, I know people who did this.'" Faehn still works at USA Gymnastics, which declined to comment because the matter is the subject of pending litigation. In the NBC interview, Karolyi said Penny had told her she shouldn't speak to anyone about Nassar and she didn't learn that the gymnasts had accused him of molestation until the allegations became public in the fall of 2016. "We were told that USA Gymnastics is taking care of all the investigation and everything to find out about this method and what he was doing," she said. The Karolyis told NBC News that through the years, they had no clue that Nassar could be abusing gymnasts on their property, and they have said it was USA Gymnastics' responsibility to monitor him. As the Nassar scandal gained critical mass in January — with scores of girls and women testifying at his sentencing for molesting girls in Michigan and many of them blasting USA Gymnastics for failing to protect athletes — the organization cut ties with the Karolyi ranch. Texas Gov. Greg Abbott later ordered the Texas Rangers to investigate what happened at the ranch; that probe, in collaboration with the Walker County sheriff's office, is ongoing. The Karolyis said they were interviewed by the Rangers earlier this year. A spokeswoman for the Texas attorney general said Wednesday that the office does not have its own open investigation into Nassar. The Rangers said the results of their investigation will be turned over to the Walker County district attorney, who will decide how to proceed.